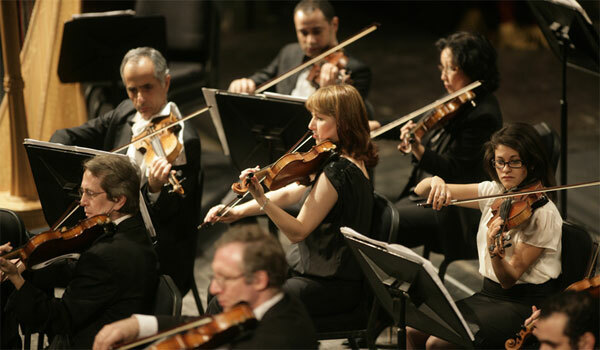 On 16 November at the Cairo Opera House, Cairo Symphony Orchestra conducted by Kristian Alexander opened the concert with Le Tombeau de Couperin (The Tomb of Couperin) by Maurice Ravel (1875-1937). Despite its title and the dedication of the movements to the composer’s friends who were killed in World War One, the piece is far from being sorrowful. Ravel combines the Baroque dance suite with modern 20th century elements. As if he not only wanted to pay tribute to the past but also to show the beauty and modernity within. All four movements were performed with spirit and sensitivity: the captivating Prélude with its twirling vivid tune, the elegant, haughty Forlane with its delicate dancing rhythm and impressionistic dissonances, the tender Menuet with the serene pastoral hautbois tune and harp arpeggios, and finally the cheerful Rigaudon which ended the piece. Next was Jacques Ibert’s (1890-1962) flute concerto. Composed in 1934, the concerto is typical of Ibert’s unique eclecticism, merging various styles and influences, and presenting extreme virtuosic challenges for the soloist. A swift and lighthearted whirling cascade of notes opened the first movement Allegro, effortlessly played by Peter Olah. The audience was immediately riveted. Olah sustained his skilful performance throughout the whole work. The impressionistic elegy of the second movement Andante was very expressive. In the final movement, Allegro Scherzando, the flute undertook a sparkling set of variations with several virtuosic leaps and trills. During the concerto, Alexander maintained an exquisite balance between the soloist and the orchestra, in turn discrete, supportive or cooperative. 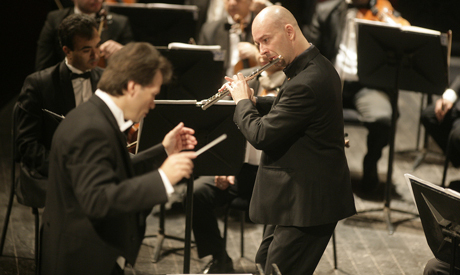 Peter Olah, the principal flute player of the Cairo Symphony Orchestra since 2005 was warmly greeted by the audience. The performance of the Ibert's concerto was a sort of celebration for him. For this was his first appearance in Cairo after he won first prize in The Alexander and Buono International Flute Competition in New York and his debut performance in Carnegie Hall in October 2013. Prior to his recent success in New York, as soloist, Olah already performed in a number of venues around the world: in Hungary, Germany, Finland, Japan etc. In the second half of the evening, the orchestra performed Belgian-French composer César Franck’s (1822-1890) Symphony in D Minor. 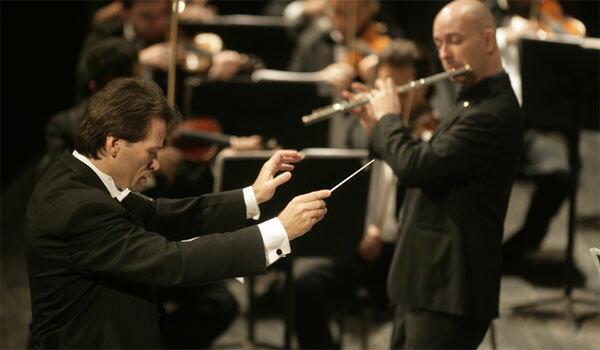 Composed in 1888, the symphony is not only considered Franck’s magnum opus but also a landmark in the genre. It represented a revival of the French symphony - neglected in the 19th century - unprecedentedly combining French style with German aesthetics and cyclic forms. Alexander’s interpretation was inspiring, carefully crafted and paced, sensitive and balanced, with beautiful lyrical expression and dramatic depth. The introduction of the first movement is based on an interrogative three note theme, previously used by Beethoven in 1826 (in the last movement of his last string quartet no. 16, noted “must it be?”) and by Liszt in 1856 at the beginning of his symphonic poem Les Préludes. After a few melancholic and wondering lines, a serene answer takes over, then they are delicately merged and developed. The second movement combines an Andante and a Scherzo. It begins with gentle harp chords lined by strings pizzicato, followed by a melodious tune by the cor anglais. The merging of both sequences creates a fantastic dreamy atmosphere. The third and final movement recalls all the themes of the previous movements (as in Beethoven’s 9th symphony). And after a short reflective and serene sequence where the harp shines, a determined orchestral tutti ends the symphony gloriously. Kristian Alexander is a Canadian conductor, philanthropist and writer. He is the founding director and principal conductor of the Kindred Spirits Orchestra and of the International Music Academy, and the artistic director of Markham Contemporary Music Festival. He was also the founding music director of the Mozarteum Symphony Orchestra in Bulgaria. He has conducted several international orchestras and has performed a vast repertoire ranging from Baroque to contemporary music. Besides master degrees in orchestral and choral conducting, he holds degrees in anthropology, psychology, theology and arts management. He has published articles on the philosophy of music, as well as research and papers. He is recipient of several national and international awards.